When Subaru refreshed its Impreza for 2013, the thought on every Subaru enthusiasts mind was “What will the WRX be like?” We all knew it’d eventually have to transition from the previous body style, but what were the details? When the redesigned WRX debuted, we found out it would only come in sedan form and it’d have a new 2.0-liter turbocharged boxer four-cylinder engine. The new WRX is rather bland looking, but by all accounts, it drives exceptionally—great news for enthusiasts. So then the next reasonable car-enthusiast question was, “What will the STI be like?” Will it be more aggressive looking? How much more power will it make? Will it still have the staple giant wing and available gold wheels? Answers to this would be Yes, 305, and yes. 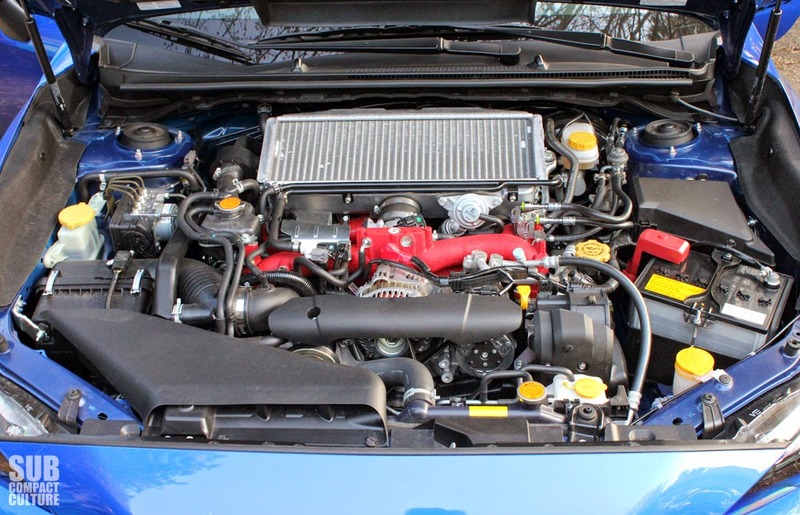 While regular ’15 WRX models get the all-new aforementioned 2.0-liter engine, the STI retains the 2.5-liter turbocharged mill from the previous generation as well as its 305 horsepower and 290 ft./lbs. of toque. 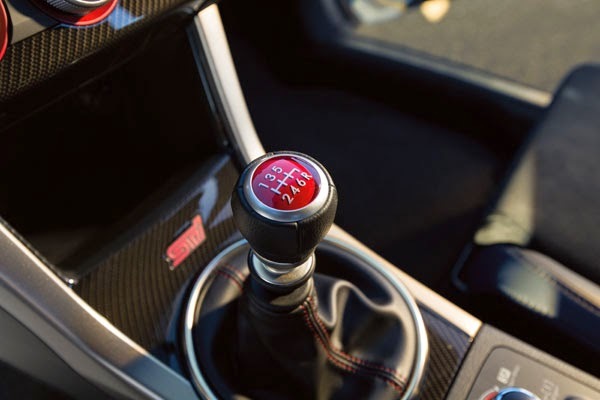 The ’15 STI also features a six-speed manual transmission, like the previous iteration. And while the 2015 WRX is available with a CVT, the STI is only available with a manual transmission … as it should be. The all-wheel-drive STI also features goodies not found on standard WRX models, such as Subaru Intelligent Drive (SI-DRIVE) powertrain management with Intelligent, Sport, and Sport Sharp modes. These help adjust performance, but mainly throttle response. It also features an adjustable center differential to optimize traction and handling characteristics. Both of these features are controlled via dials and switches located just behind the shifter on the center console. The Sport Sharp mode really does make a difference in throttle response, too. I played around with the center diff, but didn’t really notice much of a change. If I were on gravel or pushing it at a track day, I bet I would. The STI is a performance machine to say the least, and driving the car is pure car-geek joy. The engine is extremely responsive, especially in Sport Sharp mode. The six-speed shifter is as solid as it gets, with wonderful precision—truly outstanding. Being this is the Launch Edition STI, it came equipped with Subaru’s short shifter. It certainly feels more solid and on-point than my 2013 WRX’s five-speed, which still is quite good. The tenacious AWD system coupled with the 245/40/18 summer tires gives you traction that’s akin to gum on hot asphalt. Grip is not an issue in nearly any situation. There is zero wheel spin and acceleration borders on violent. The car sounds great, too; there’s a bit of that classic Subaru tone to the exhaust, but it doesn’t seem as pronounced as my ’13. In the handling department, the car corners flatter than Nebraska thanks to its sport-tuned suspension. Turn-in is very quick due to the low 13:1 steering ratio. I’ll tell you that no matter what I was able to throw at the STI, it rewarded me with exceptional handling characteristics. As with most vehicles, that handling comes with a trade for ride quality, and this car rides very stiffly. You’ll feel every bit of broken pavement, every bit of coarse aggregate, and every pothole. Combine that with the wide, low-profile tires and you’ll get substantial road noise. Then again, no one is buying an STI for the highway ride and lack of road noise. If I had to choose a weak point on the last generation WRX and WRX STI it was the interior. It felt cheap in many respects; full of hard plastic surfaces and somewhat flimsy trim bits. (I should know; I own one … and love it regardless!) Subaru has addressed this on the ’15 model, and it’s quite apparent in the STI. Fit and finish is greatly improved; styling is more modern; and there is “carbon-fiber-like” trim throughout the cockpit. Frankly, there might be a bit too much carbon- fiber-like trim. There are a plethora of gauges and color LCD displays with various menus that feature range, traction information, fuel economy, and a boost gauge. The displays are easy to read and vibrant. Everything is intuitively laid out, including the HVAC system. There’s enough interior goodness to be sporty and modern, but not so much tech wizardry to make it annoying and difficult. Since this is a sedan, there is a fully functioning back seat and it provides a good amount of space for any would-be passengers. If those passengers have luggage, it should all fit in the generously sized trunk, too. Subaru got the driving position spot on, at least for my scrawny 5’7” frame. There are well-bolstered heated sport seats; a chunky, flat-bottomed, leather-wrapped steering wheel; and a shifter position that feels just-right, allowing for scads of sporty driving confidence. The only confounding variable is that giant rear wing, which can hamper visibility when changing lanes. Despite this, the car is very easy to drive quickly. The combination of seating position, a slick shifter, quick steering, and light clutch allow you to easily pilot the STI in a rapid manner. It never feels like it’s going to get away from you, but at the same time, you’re able to really scoot. I mean REALLY scoot. And not that many people are concerned with the fuel economy of a 305 hp vehicle AWD rally car for the street, but the ’15 STI is EPA rated at 17 city and 23 highway MPG. I have no idea what we got, nor do I care. There were a couple of things that could’ve been better. 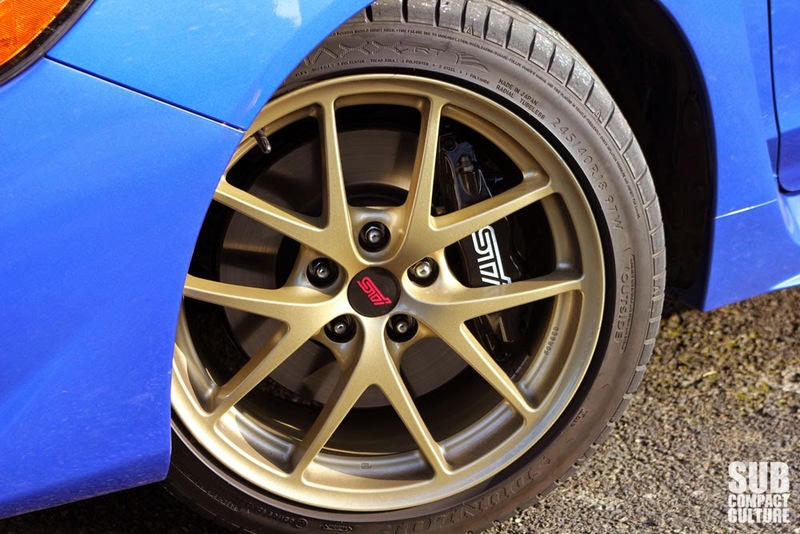 While the car has four-wheel Brembo disc brakes, I thought there could be better brake feel. While still good, I was expecting great. The other thing was the stereo. The sound was good enough, but it wasn’t loud enough. I often found myself having to crank the volume to 38 out of 40 on my favorite tunes, despite the system having 440 watts, an amplifier, nine speakers, and a subwoofer. 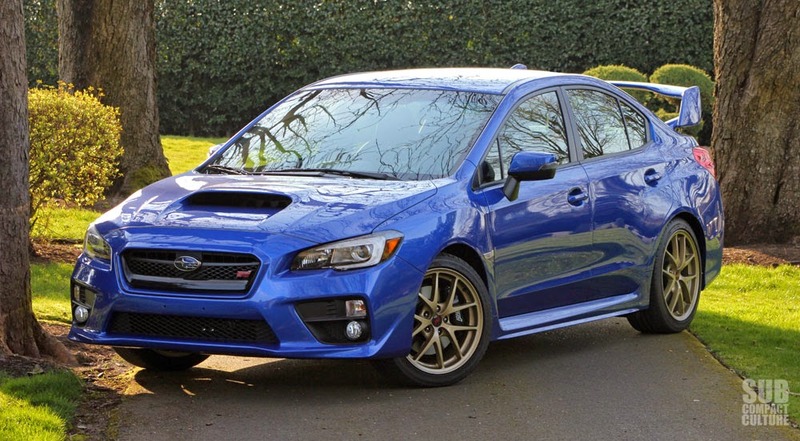 This STI Launch Edition will run you $38,190. For that you get everything mentioned here including the gold 18” BBS wheels, short-throw shifter, keyless access/start, and the signature WR Blue Pearl paint. Subaru says the STI will do 0-60 in 5.1 seconds; Motor Trend did it in 4.6 second, and ran the quarter mile in a scant 13.1 seconds at 104.4 MPH. Folks, that’s as fast as cars costing much more (say, a Porsche Cayman). From a performance standpoint, this compact sedan is a bargain, even at $38K. 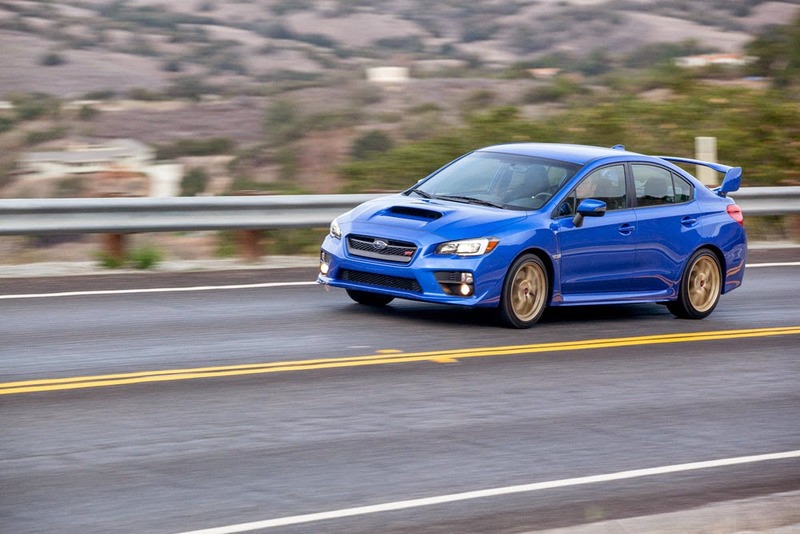 The age-old question is this: Is the STI worth the extra price compared to a regular WRX? A regular WRX can be had for a bit over $27,000 including destination, so this ’15 STI Launch Edition will go for $11,000 more than that. That’s a sizable chunk of change. You do get the adjustable center diff and driving modes; you get the wide-body design and forged 18” BBS wheels; you get 37 more horsepower and 32 ft./lbs. more torque. While I personally couldn’t justify the extra cash, many will, and I have a feeling each Subaru dealership won’t have an issue moving its allocation of STIs. After all, even at $38K, it’s a compact car that’ll take on some of the world’s best for a fraction of the cost. And while I’d much prefer an STI (or a WRX) in the hatchback variant, this is one fun sedan with a ton of power and two tons of personality. Not even close. That's a bit decieving. I got my STi limited with a short shifter, SPT exhaust, NAV and push button for $37,500. An optionless STi limited would have come to $35,500. If we're comparing sticker prices, then yes, it's about an $11,000 difference between the price of admission on a WRX and this Launch Edition STI. I only have MSRP to go by. Acceleration doesn't border on violent, it IS violent. After half an hour on some local back roads I had a good case of motion sickness. Of course I didn't tell Andy to stop, it was to much fun!